This view remained little changed until the construction of Route 280 altered the landscape. The new highway right of way necessitated the road being moved to a bridge constructed across the narrow stretch of water visible between the trees. The foreground where three saplings are visible is now the location of the west bound 280 entrance ramp on Clifton Avenue. 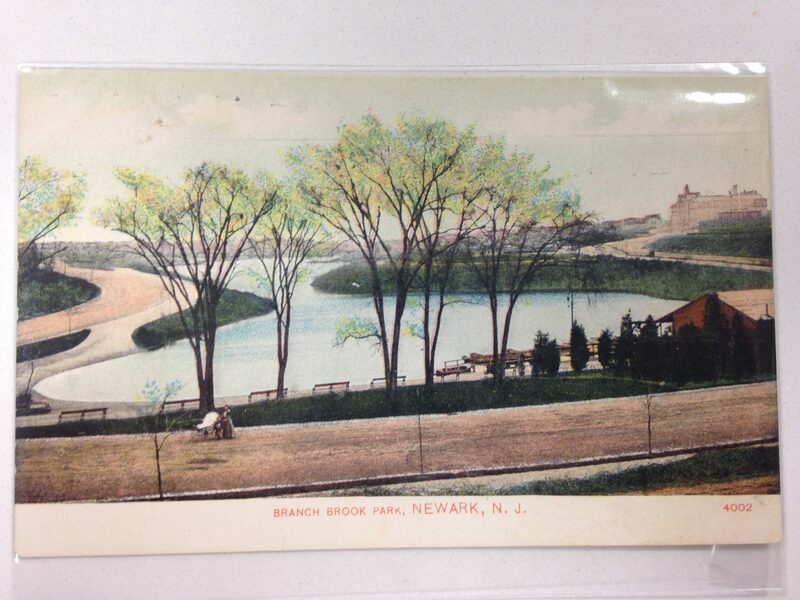 The image in the right distance is the old Barringer High School constructed in 1899 and now demolished. The image in the near right is the boathouse and along the shore of the lake the docked boats are visible. The view is quite serene with a solitary lady pushing a baby carriage. While the post card is in color the original image probably wasn’t. In the hand coloring process done before the card was printed there may have been some artistic license taken – as seen in the flowering trees . Still the overall effect is quite pleasing part art, part actual image. Both my dad and my mother in law went to Barringer High…many years ago….he probably graduated about 1941 and my mother in law about 1939…I love your posts. If you give me their names I can see if they’re in the yearbook I have from 1938.